Chopped almonds and dried apricots add the perfect blend of flavours to these yummy Peanut Butter and Apricot Snack Bites. Both simple and fun to make with the kids, these bite-size treats are the perfect snack to enjoy anytime of day. 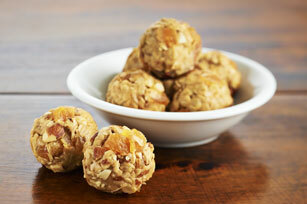 These easy-to-make Peanut Butter and Apricot Snack Bites can be refrigerated up to 1 week before serving.